A few weeks ago the farm suffered a setback – fungus gnats! After all that care with the “pathogen free” potting soil and everything. The containers in the cabin all had them, as did the containers with deeper soil that generally stay in the cockpit, at that time with chard and chickweed. On the bright side, I knew what I was looking at. Over the next two days I had a feast on all the sunflower and broccoli and pea sprouts that were inside the cabin, and the soil went into a sealed plastic bag. The cockpit plants got to keep going, since at least the gnats were outdoors (rather than buzzing my face), and Suzanne and I had a shore-support meeting planned for about a week later. The almost immediate harvest of the indoor plants staved off the annoyance of fungus gnats flying all over the place, since their population had not yet really gotten into gear, and because I knew what I was dealing with I didn’t start any new indoor containers while the cockpit population was still present. Before the gnats issue surfaced, Suzanne and I had already planned to swap cockpit containers. She was bringing a new one that she had started with lettuce plants a few weeks before, and I would be giving her back the one with the chard, which was having issues with its cockpit location. Since the chickweed was especially infested, when Suzanne came she took that container away also – I was sad to lose it, but have some ideas about how to do this better, collecting seeds from the chickweed plants at home rather than digging up plants and soil. Chickweed – so often weeded out rather than harvested – is incredibly nutritious and quite tasty, as well as being a good laxative, and thrives when the weather gets cool and moist, as it does when one goes up the coast and fall comes around. Suzanne also brought a yogurt container with a lovely, thriving parsley plant. At home I eat a lot of parsley, not really as an herb, but as a leafy green. It’s loaded with things that are good for you, is strengthening for bladder issues, and I’ve developed a real taste for it. It’s been a treat to have such a nice, big plant. For most of the last couple of weeks since Suzanne’s visit I didn’t do any new indoor planting, allowing a bit of a quarantine period for the new containers with the lettuce and parsley, even though they were originally staying mainly outside. No gnats in sight, so about five days ago, in clean containers, I got to plant some more seeds for the cabin racks. Sunflower, buckwheat, and chard, one container each. No worm compost this time – it’s not labeled as “pathogen free,” and it seems like a possible source for the gnats. It’s also possible that the cockpit chickweed container was the gnat source, and being flying creatures, some of them moved indoors, so the idea is to rule out various possibilities one by one. So far so good. 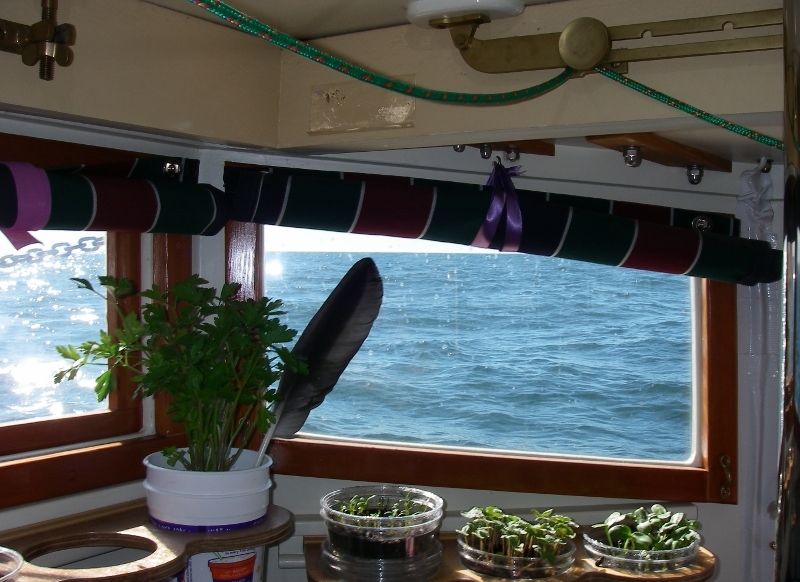 Lately the parsley seems happier indoors, and I’ve taken to moving the lettuce container inside whenever I am sailing, even when there is no obvious spray. Little brown spots on the leaves have looked like more spray than is apparent is getting to the plants. They go out for the coolness in the night, and for days in harbor, and seem to do well with the rain and fog we’ve been having. The lettuce had been starting to bolt already when it arrived, what with that intense, ongoing hot weather that was all over southern New England in July, but since things have cooled off it does not seem to be shooting right up, so I’m hopeful that I’ll have it for another while. The parsley is growing fast enough to replace the sprigs I’ve been picking every day or two, which is very encouraging, and it makes a pretty kind of house plant here in the window. Still no gnats in sight, even with the deep-soil containers coming indoors. So now the sunflowers are sprouting, as they do so readily, and I’m happy to say that both the chard and the buckwheat started coming up a few days ago. The buckwheat is particularly energetic, so I guess the reason it wasn’t working before had to do with old seeds. When Suzanne came to South Freeport she brought fresher ones – I’d had the other batch in the cupboard for longer than I should have, probably two or three years. None of these were seeds for planting, just raw buckwheat, from places that sell raw foods. The ones that are doing so well came from Raw from the Farm, an Internet store by that name, but it’s very possible that any bulk buckwheat groats from the natural food store would do just as well. It’s probably good to get the kind that still have their hulls. So that’s the latest on the farm. I’m really liking how well the yogurt container with the parsley is doing, and am thinking that two or three more yogurt container plants, with more substantial soil than the little sprouts containers, might work out just fine. If the tiny chard sprouts grow well, then in addition to harvesting small leaves, one or two of the plants might work as transplants in yogurt containers, intended to grow larger for picking big leaves. The broccoli from the previous batch of planting started off with very leggy little plants, so I started putting the container outside for full light when it was convenient, and harvested the really long skinny ones. The next ones that sprouted were behaving better (all before the big gnat-inspired harvest). Some time with outdoor light may be necessary for the chard also. So far the buckwheat, which sprouting resources refer to as “buckwheat lettuce,” seems to be growing properly with the available indoor window light, with broad little lettuce-like leaves, though the plants are still only about an inch tall. The sunflowers always get a bit tall, but they have nice thick stems, and the stems are just as tasty as the leaves, so it feels like a perfectly fine way for them to grow. And they love the heat inside the cabin, so they just get to do their thing in here. That’s about it for plants excitement. What with lots of recent visiting, folks have been bringing me everything from blueberries, microgreens, and a new supply of romaine lettuce, to garden lettuce, zucchini, and foraged seaside greens and flower petals, which have all been a huge, enormous treat. Thank you, thank you, Patsy, Polly, and Reilly! With the farm still being in development – and then round two of the fungus gnats – it’s been a real treat to have an abundance of vegetables from off the boat!